Style icon Christan Dior is quoted as saying that Chanel Costume Jewelry revolutionised fashion and jewelry "with a black pullover and ten rows of pearls". Chanel's fashion and costume jewelry created a storm in the 20th Century and transformed fashion and jewelry for ever. Before Chanel resuscitated "black" into life, it had only ever been associated with mourning jewelry. Like her, or loathe her, Coco Chanel, more than any other designer of her time was a real Natural Pearl Connoisseur. By pearl connoisseur, I mean, Chanel understood what was truly unique and beautiful, and was not influenced by other peoples preconceived ideas or their technical standards. She had a special gift for "knowing" not only what worked in contemporary fashion, but also what "style" would have lasting quality. Lasting quality is often overlooked when new to collecting Vintage and Designer Costume Jewelry. Successfully identifying an illusive quality called "lastingess" is an innate skill developed through the power of oldness and many years of experience. With today's fashion designers adding costume jewelry to their runway collections, vintage and designer costume jewels have provided inspiration for Haute Couture for the last eight decades. A legend of French haute couture, Coco Chanel, 19 August (1883-1971) was born, Gabrielle Bonheur Chanel in Saumur, France. In the History of Jewelry there's been so many remarkable costume jewelry designers and so trying to match the jewelry with the jewelry designer throughout this short history, is overwhelming, even for the connoisseur costume jewelry collector. This is why I decided to create Identifying Costume Jewelry by designer. Chanel Costume Jewelry is treasured by Antique Jewelry Investors. Her designs challenged the conventions of the day, dispensing with the ice floe of conventional jewelry, Coco plunged ever deeper below its surface. By combining genuine and fake; evening jewelry with daytime clothes, a new state of thinking, not just the chanel pearl necklace emerged. The craze for costume jewelry and a long pearl necklace started during the decadent days of the "all-that-jazz" era. Chanel took jewelry that was previously meant only to be imitations of actual jewels and re-arranged the jewelry and the concept, exaggerating these pieces so that they would never be mistaken for fine jewelry. Fine Art Deco Jewelry was a major influence of faux costume jewelry under Chanel. By the late 1920s the fashionable handcrafted jewelry boxes of fashionable women contained both fine and faux jewelry. The richness of color and the size of these faux creations grew into exaggerated sculptural forms of astonishing beauty. Chanel "imitations" though were anything but mere "copies". They were worn outrageously, such as when flappers looped long strands of oversized pearl necklaces around their waif-like figures. Costume jewelry, such as Chanel costume jewelry became a seedbed for design ideas, that look as fresh today, as when it was first created. From Coco Chanel in the 1920s to Yves Saint Laurent in the 1970s to Lanvin of today, Haute Couture costume jewelry has been an eye-catching accessory to enhance a designer's view of fashion. 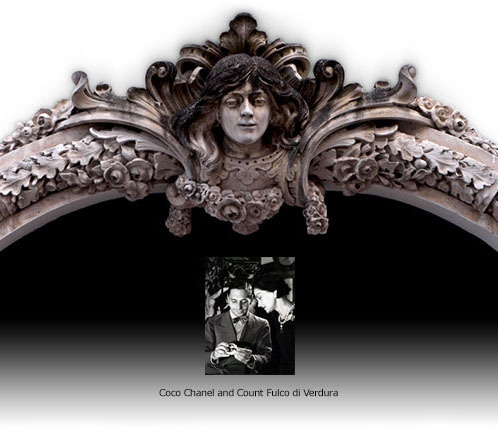 From 1929 to 1937, Chanel met with Count Fulco di Verdura (not Vendura) and sparks fly - he launched a series of extraordinary designs in "rococo" and "baroque" styles that included her signature Maltese Cross Bracelet with multicolored stones; Chanel costume jewelry book pieces. Fulco Santostefano della Cerda designed many of her finest pieces from the mid-1920s to 1934, the Duke of Verdura (1895-1978). The Count's eccentric life in Sicily provided a wonderful source of inspiration. Count Verdura was also a source of inspiration for the renowned - Miriam Haskell. Chanel loved 'fallalery, fakes and imitations' which included, gold toned chains, and "poured glass" jewelry by Maison Grioix. Baroque pearls, often feature on many of the historically inspired Chanel Costume Jewelry pieces, such as her Byzantine and Renaissance style crosses, earrings and, pearls - faux pearls, not to be confused with Saltwater Cultured Pearls. The genius of Chanel, is that she managed to incorporate Costume jewelry into her haute couture fashion philosophy. The new glamorous fashion jewelry was designed to complement the clothing worn on the runway and for photo shoots. At a time when fine jewelry defined a woman's status in society, Chanel removed the seriousness and daringly mixed it with pieces that were - fake. "Jewelry isn't meant to make you look rich," said Chanel, "it's meant to adorn you." Chanel often copied her favorite fine-jewelry pieces which included colorful renaissance-inspired designs. These were presented to her by her two most important lovers: the polo-playing English diplomat, Arthur Boy Capel, one of her first investors, and the extremely wealthy, "Bend'or" the Duke of Westminster. Arguably the most visible female personality of her era, Gabrielle Chanel invented a style synonymous with modernity. And here's an interesting liitle fact you won't find anywhere else, she also worked with genuine Natural Diamonds, designing an exceptional collection of the finest Diamond Jewelry for Debeers, that was anything but Costume. Phillips, C., From Antiquity to the Present, Thames & Hudson, London, 1996.